This Arlington Heights couple wanted a light and airy kitchen with prime functionality and room to entertain. To provide added function for entertaining, a large 7 ¾” x 5 ½” working island with a built-in lowered breakfast table was placed across from the 4’ Galley Ideal Workstation and adjacent to the 48” gas range making workflow effortless. Three walls of Rutt HandCrafted Cabinetry arch the room, providing the family with ample storage. To top off the design and create a pleasing backdrop, white gloss subway tile graces the outlying walls, while 16”x16” Canopy Bianco Carrara Marble is featured as a textured accent wall behind the range. A Galley Ideal Workstation 4 in stainless steel with bamboo accessories makes this Arlington Heights kitchen re-design function as good as it looks. 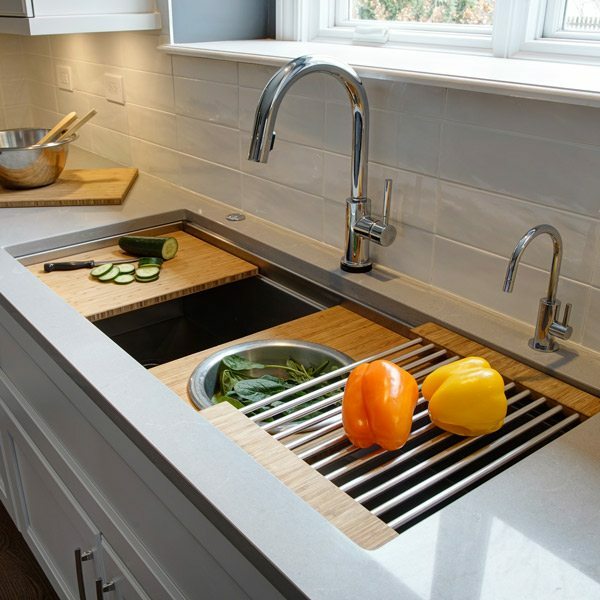 This optimized sink provides the family with an area to prepare, cook, serve, and clean their food all in one convenient and hassle free area, and keeps the other areas open for gathering. Interested in learning more about the Galley Ideal Workstation, visit here.